If you're currently in college or have recently graduated, chances are you'll have had someone ask you if you've done any internships. Internships are a great way to see if you like a field that you're interested in and test the waters of a certain industry. At the best internships, you'll have a great boss who can later write you recommendations and become a resource for you, get to network with other people in the office, and maybe you'll even make a little bit of money. On the flip side some internships can be stressful if you're overworked and underpaid (or likely, not paid at all) and if you feel like you don't actually take away anything from the experience. I was lucky in college to have many amazing internships where I learned a lot and made great connections, but after I'd decided I wanted to work in editorial I realized that a lot of the internships I did shared many similarities in terms of my day-to-day tasks (not to mention that 5 out of the 6 that I did were unpaid). But there was something else I did in college where I learned so much about fashion and got incredible work experience. I was constantly challenged and never got bored in the two and a half years that I worked there and I got paid. Yes, I'm talking about my retail job. 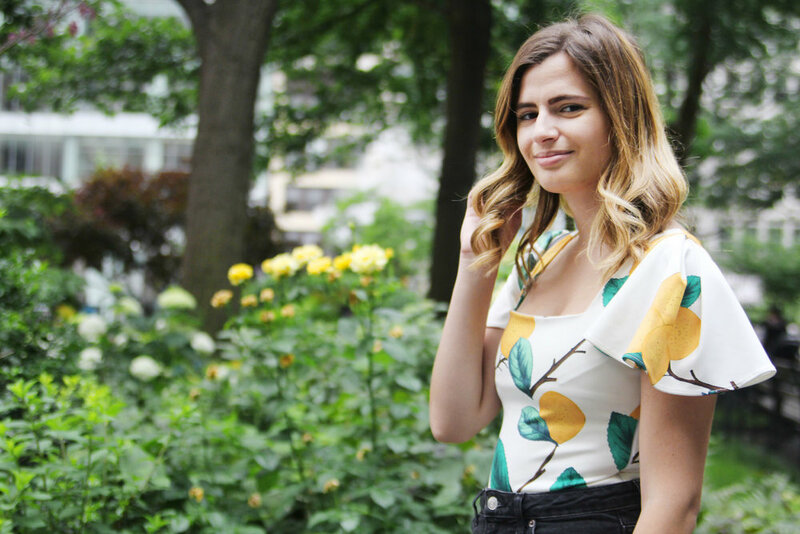 If you don't already know I was lucky enough to work at Free People's flagship store in Rockefeller Center throughout most of my time at Barnard and I wanted to talk about why I valued this experience so much. When I get asked about my fashion experience in college, people are almost exclusively interested to hear about what I did at my internships. This is understandable, but let me explain why I'm just as glad that I had this job at Free People. Sometimes trends appear on magazines pages or on websites that you think seem cool but not a lot of people actually go out of their way to buy those pieces. It was interesting to see what customers were buying lots of and what sold out quickly compared to what found its way to the sale rack after a few weeks. And the best part was I could ask for their feedback about why they preferred one item over another. My favorite part (to the surprise of probably no one reading this) was working in the fitting room. I loved to give suggestions of things to pair with what a customer already had picked out or to recommend a pair of shoes to try on with a dress that maybe they'd end up buying also. I also found that people really appreciated honesty in the fitting room. If something wasn't working for a customer's body, I'd try to find her an alternative that did, but I always wanted people to leave feeling amazing and confident in what they were buying. When you work at a magazine it can be hard to remember that each brand has so much more to it than one capsule collection or one press release. I really got to understand the brand DNA of Free People and the different personalities of FP customers that the brand developed (for example Lou was tomboy chic while Candy was super girly) and could use that to tell a story and ultimately sell products. Our store managers were constantly encouraging us to look at the website and learn about new pieces that were coming in and to even come in early and try them on so we could tell customers how they fit. I even helped install holiday decor one year and learned about the concepts that the Home Office in Philadelphia had sent over and how we were going to create and execute them to create a store that people wanted to spend time in. After a few months of working at FP, I could tell immediately when someone didn't want to be bothered when they came into the store or if they were looking for a BFF fill-in as they shopped around. This is probably the skill I've been able to utilize the most in the editorial world and one that I wish more people understood because if you're emailing me blindly every day asking me for a deskside and I haven't responded, you might want to put your energy elsewhere. Or if a co-worker is having a bad day I might decide to email them a question rather than ask it in person just to give them time to respond in a more thoughtful way. While it may not have been glamorous taking out the trash at night or tagging 200 shirts in the stockroom, I really did love my job and it was amazing to be paid for the work! We didn't work on commission so I never felt super competitive about my sales numbers but it was nice to get a congrats from a manager when I made a big sale and they'd be more likely to let me work in the fitting room rather than at the cash register if that's what I enjoyed doing and could prove that people walked away with purchases that they loved. It was unpredictable working in Rock Center and constantly meeting people from other countries who came into the store and it got a little crazy during the holidays but I always loved being there because the store was beautifully decorated and the people who worked there had such good, friendly vibes. I can't say every company is like Free People, but there is so much that can be gained from working on a sales floor and experiencing that side of the industry. So that being said, if you want to work in fashion but are having trouble finding an internship or you can't afford to work one unpaid, don't rule out retail jobs. You may be surprised at some of the people it leads you to or the doors it opens for you.